344 pages | 9 B/W Illus. Today, the risks associated with global environmental change and the dangers of extreme climatic and geological events remind us of humanity’s dependence on favourable environmental conditions. Our relationships with the landscapes and ecologies that we are a part of, the plants and animals that we share them with, and the natural resources that we extract, lie at the heart of contemporary social and political debates. It is no longer possible to understand key social scientific concerns without at the same time also understanding contemporary patterns of ecosystem change. 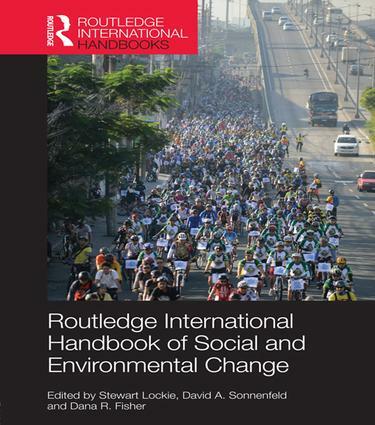 With case studies from sectors across both developed and developing worlds, the Handbook illustrates the inter-connectedness of ecosystem health, natural resource condition, livelihood security, social justice and development. It will be of interest for students and scholars across the social sciences and natural sciences, as well as to those interested and engaged in environmental policy at all levels. Stewart Lockie is Professor of Sociology at the Australian National University. David A. Sonnenfeld is Professor of Sociology and Environmental Policy at the State University of New York College of Environmental Science and Forestry (SUNY-ESF). Dana R. Fisher is Associate Professor of Sociology and Director of the Program for Society and the Environment at the University of Maryland.